Watches are timeless. 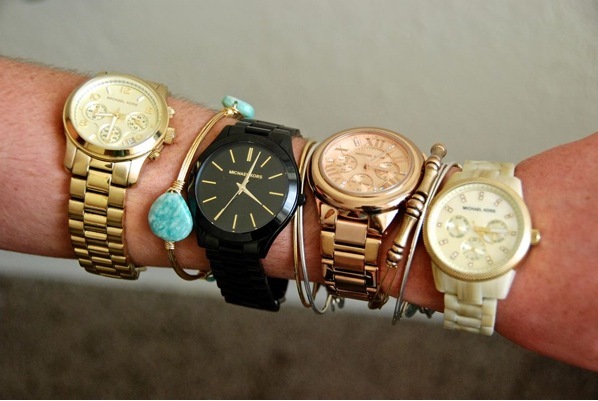 Since Michael Kors, Marc Jacobs, Kate Spade and countless other designers launched their lines years ago, fashion watches have continued to gain popularity. Rose Gold: match with silver jewelry to play it safe. A chunky rose gold watch would make a stellar combo with a silver Alex and Ani bracelet. When pairing rose gold with traditional gold baubles, ensure the gold is not too yellow because it will clash with the watch. Gold: goes best with more gold. When done tastefully, I believe you can never wear too much gold. Nothing looks better than a gold, small-stoned Bourbon and Boweties bangle with a chunky gold watch. Yes, certain silver jewelry can mesh, but you can’t go wrong with double gold. Have I said gold enough? Silver: the most versatile watch color. Throw on some gold, yellow or white bangles. Have a rose gold ring? Go for it. Even silver on silver looks stunning. Pair a silver Michael Kors timepiece with a Pandora bangle with minimal charms for the perfect match. Neutral, easy and classic! Bone and Tortoise: depends on the face color. Since it will likely have a gold or white face, it’ll look best with gold jewelry. Nothing beats the rich look of dark tortoise with a bright pop of gold. Even bone, a lighter look, combines effortlessly when paired with an elegant gold bracelet. Black and gold go hand in hand. Bracelets, rings or anything gold screams a perfect match. Even with this guide, keep in mind there are no rules when it comes to fashion. It is individual, distinctive and ever changing. Find what works for you, and rock it!